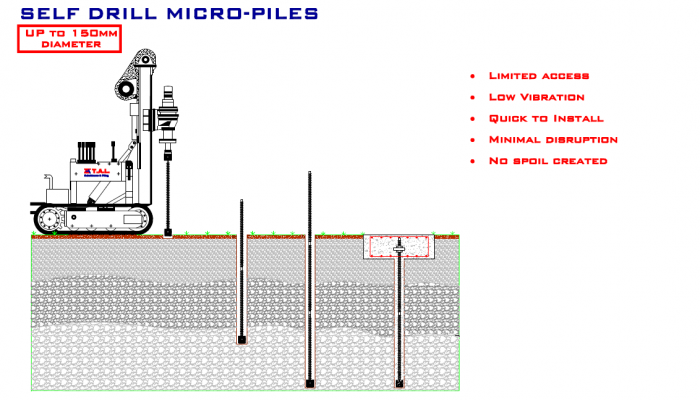 What is Piling and Mini Piling? When working in areas of limited access, such as house extensions or other domestic work. When working in areas where noise and vibration are concerns. When building on ‘made’ ground. When working with weak/ soft ground conditions. Step 1: Set up with Lead Auger at the Pile position. Step 2: Drill to desired depth adding segmental Augers as work progresses. 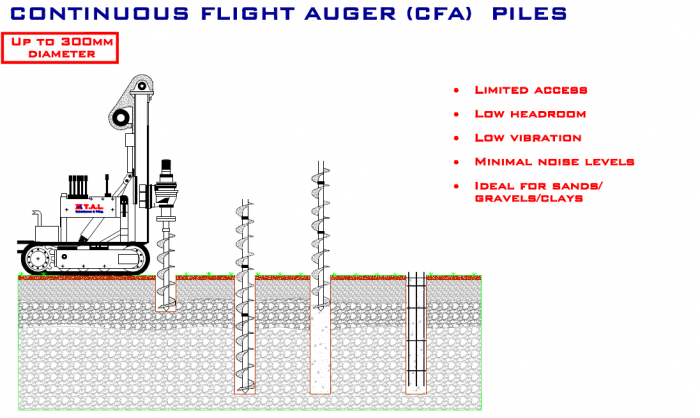 Step 3: Withdraw Augers while filling the borehole with grout through the hollow stemed Augers. Step 4: Insert Reinforcement into wet grout. Step 1: Set up with lead casing on ground and drop hammer casing. Step 2: Drop the hammer from a pre-determined height to drive the casing into the ground to a set depth adding casings as work proceeds. Step 3: Withdraw the drop hammer. Step 4: Fill the pile casing with concrete/ grout and place reinforcement. 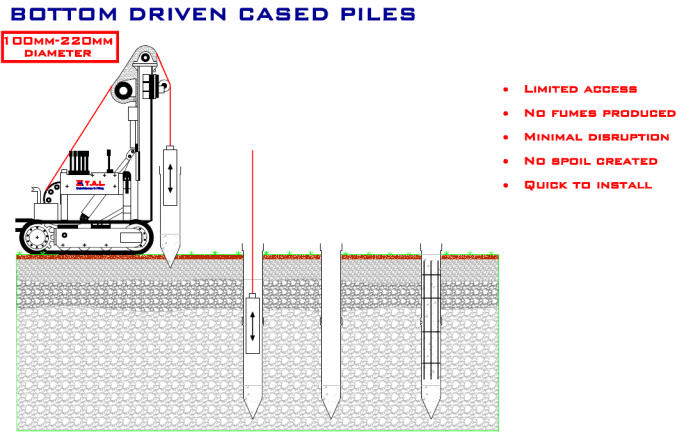 Step 1: Set up with drill; with or without permanent casing at pile position. Step 2: Drill to desired depth adding drill rods and casings as work proceeds. Step 3: Remove drill rods leaving empty pile borehole. Step 4: Fill pile borehole with concrete/grout and place reinforcement. Step 1: Set up with drill bit at Pile position. Step 2: Drill and inject grout simultaneously. Step 3: Drill to desired depth using couplers to add extra lengths of threaded hollow bar as necessary. Step 4: Secure anchor plate with two load bearing nuts and cast into concrete beam. 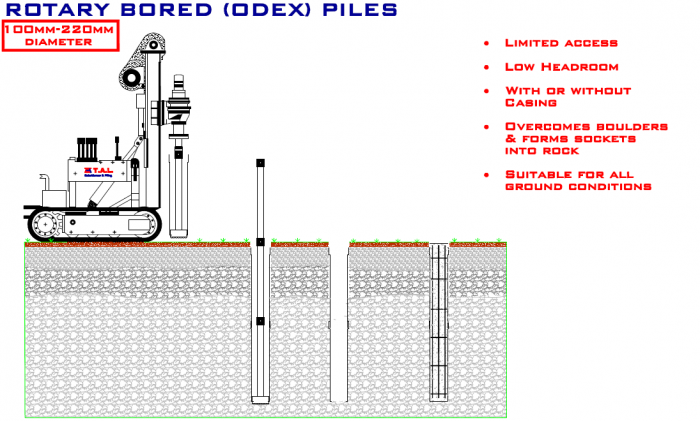 If you are in the public sector, a developer or a contractor, and you are considering working with us in relation to piling and mini piling, contact us in our Dublin office on 01 6310300 or in our Cork office on 021 4345999.